WARSAW, Nov 18 2013 (IPS) - An International Coal and Climate summit organised by the Polish Ministry of Economy and the World Coal Association kicked off Monday in the Polish capital Warsaw in parallel to the United Nations Climate Change Conference COP19, amid outcry from environmentalists who accused COP host Poland of bias in favor of the coal industry. The presence of United Nations Framework Convention on Climate Change (UNFCCC) Executive Secretary Christiana Figueres at the coal summit was also broadly criticised. Speaking at the opening of the summit on the morning of Nov. 18, Figueres said the coal industry must clean up if it wants to have a future. Coal is the dirtiest of fossil fuels, accounting for over 40 percent of global CO2 emissions coming from fuel combustion, according to the International Energy Agency. During the coal meeting on Monday morning, the Polish Ministry of Environment and the World Coal Association collected endorsements and formally presented to Figueres a document called The Warsaw Communiqué. The document adds up to a call for public support for an industry that is feeling the heat from climate policies adopted around the world. While the fate of the coal industry varies globally, in Europe and the U.S. coal producers are certainly under pressure. In the EU, revenues from coal have been plummeting over the past years, on account of diminished demand during the crisis and rising supply of electricity from wind and solar as the block is moving ahead on its target to have 20 percent of its energy needs met from renewables by 2020. At a global coal industry conference that IPS attended in October in Berlin, Germany, the mood was gloomy: coal plant operators in Europe were complaining of severe losses, while utilities in the continent spoke of plans to shut down coal units and move increasingly towards gas and renewables. During 2013, the two biggest international financial institutions, the World Bank and the European Investment Bank, have significantly tightened their lending to coal, and the U.S. administration and Nordic countries in Europe decided to put an end to financial support for coal plants abroad. 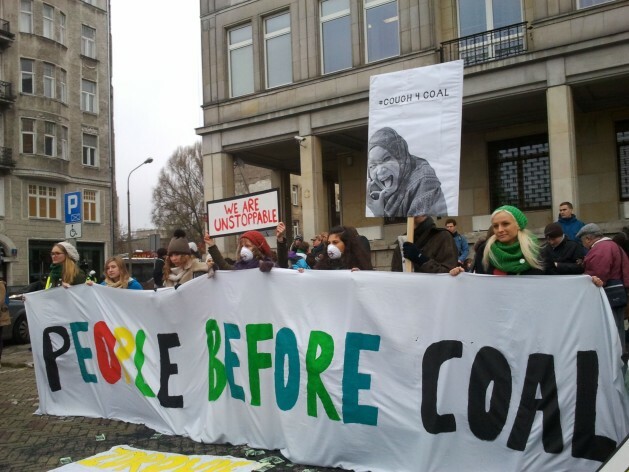 Poland is one of the few countries in Europe to maintain a bombastic pro-coal rhetoric. Less than two months before COP, Polish Prime Minister Donald Tusk infamously declared, “The future of Polish energy is in brown and black coal, as well as shale gas. Some wanted coal to be dispensed with, but energy independence requires not only the diversification of energy resources, but also the maximum use of one’s own resources.” Almost 90 percent of the country’s electricity comes from coal. Yet, even in Poland, the reality is shakier than the rhetoric. Speaking in November to news agency Bloomberg, Krzysztof Kilian, head of the Polish state power company PGE which plans to add two 900 MW units to its existing 1,500 MW Opole coal plant in the southwest of the country, said there was one way for PGE to avoid making losses from the new units: if it secures state-backed guarantees for prices of the type nuclear producers in the UK are obtaining – in practice, that would mean that the state would guarantee as much as twice the market rate. The coal industry, at least in Europe, has of late engaged in an offensive for drumming up public support and for diminishing the amount of public resources going to renewables. But given the ascension of climate policies around the world, for public support for coal to continue one crucial argument needs to be made: that coal can be clean. And this is the focus of the Warsaw coal summit. On the agenda of the coal summit were three main ways put forward so far for “cleaning up coal”: carbon capture and storage, underground gasification, and efficiency improvements at plants. Carbon capture and storage (CCS) – the biggest hope of the industry and mentioned by Figueres herself in the coal summit speech as a way forward for coal – would involve capturing CO2 from coal units before it is emitted into the atmosphere, and storing it underground. Yet despite significant investments being made in the development of CCS, its deployment on a commercial scale has to date not been proven feasible. This September, Norway gave up a large-scale CCS project at Mongstad deeming it too risky; the country’s auditor general had criticised Norway’s spending over one billion dollars on CCS projects between 2005 and 2012. Another “clean coal” scenario involves what is called underground coal gasification. The technology is based on partially burning coal underground instead of extracting it. Yet the combustion process used in this method results in high carbon emissions, not only of CO2, but also of methane, which has 23 times the warming potential of CO2. As a consequence, underground gasification would still need CCS deployment. Another idea for cleaning up coal involves improving the efficiency of plants. Yet existing coal plants are generally less efficient than gas ones, and making them more efficient (46 percent efficiency for a coal plant is considered the best possible, compared to 60 percent for gas) is costly – given the current energy price context in Europe, this does not yet make business sense. Co-generation – that is, using the heat released when burning coal for electricity to produce heat – would be another way to improve efficiency. In this scenario, however, units would have to be smaller and closer to communities – which raises the dilemma of social acceptability.